Lions Befrienders is a Social Service Organisation which was formed in 1995 by the Lions Clubs of Singapore and a Lions District Project. Its mission is to provide friendship and care for seniors to age in place with community participation, enabling them to enjoy meaningful and enriching lives. 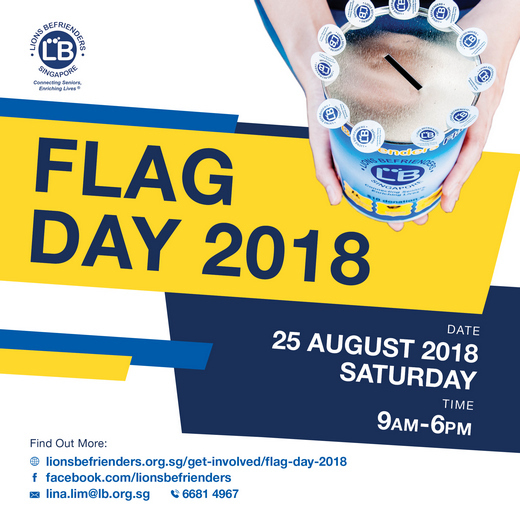 To sustain its services to the vulnerable seniors, Lions Befrienders will hold its annual Flag Day on 25 August 2018, Saturday. It aims to raise $150,000 from this event that will benefit the seniors. Join as a Flag Seller to make a difference today! Flag sellers are great assets, they not only assist in raising funds, but also in spreading the awareness of the seniors to the public. Your support will enable Lions Befrienders to end social isolation amongst its seniors, empowering them to live active, healthy & happy lives in our community.